You already might know that good quality sleep is an essential part of good health. It’s in our best interest to get 7-9 hours of shut eye every night. Today we want to offer you 12 daily practices that you can implement into your life and start to develop a healthy sleep habit. We understand that some of you don’t always have the luxury to be in full control of your schedule. Some of you might work the night shift or perhaps have family obligations that cause you to fit in whatever sleep hours you can. Maybe parenting duties keep you up during the night. No matter what your situation, you can still benefit from implementing the following suggestions and ensure a good night’s sleep every night. Sleep is quite complex. There are 5 stages of sleep and over the course of a night’s sleep, you cycle through all of these stages, with each sleep cycle taking approximately 90 minutes. Stages 1 and 2 are considered “light” sleep, while stages 3 and 4 are “deep” sleep. The 5th stage is REM (rapid eye movement) sleep, which is when you dream. Did you know, when you wake up during “light” sleep, you wake up rested and feeling good? Conversely, when you wake up during “deep” sleep, you feel groggy and are more tempted to hit the snooze button. If we go back in time – our bodies have a circadian rhythm and are naturally supposed to wake up. However we have destroyed this organic balance by staying up late and using an alarm clock to determine the time we wake up. Think about it day after day you have a loud abrupt noise (alarm clock) jolt you out of bed – which will surely put you into “fight or flight mode”. This increases your heart rate, pumps up your adrenal levels and overtime is an invitation for chronic stress. 4 tips to help start your morning calm, collected, and ready to take on the world! Teach yourself to wake up on time by priming your body’s internal clock – stick to a regular bedtime routine and train yourself to wake at a certain time. Go to bed at the same time every night and allow yourself to sleep until you wake up naturally. No alarm clocks! If you continue to keep the same bedtime and wake up naturally, you’ll eventually dig your way out of fatigue and arrive at the sleep schedule that’s ideal for you. Your body will also reap the benefits of a natural cortisol release in the morning and melatonin at night. As long as you stick with a proper and regular sleep schedule. Practice on weekends and holidays. Try waking up without an alarm clock on the weekends. If you have an extended period of time off for a vacation or a holiday, this is also an ideal time to adjust to life without an alarm clock. Keep a sleep diary. Before you abandon your alarm clock, you need to fully understand your current sleep patterns. For at least one week, note the time when you go to sleep and the time when you wake up. If you find that you are going to bed too late, slowly start to change your bedtime. It’s best to work in 15 minute increments rather than jumping from a 11pm bedtime to a 10pm bedtime. You can still set an alarm if you are worried you won’t wake. I personally got to a point where I was waking before my alarm would go off. If this happened I would wake right away and not rely on the alarm clock. By waking up early you start the process of helping your endocrine system link up with the diurnal patterns of the earth. Get up when the sun rises. You might start off having a challenging time, but after less than a couple of weeks, your body will adapt to that pattern and have you feeling more rested and refreshed when you wake up. If you actually thought about it, you probably have a routine that you habitually do without any awareness. Make sure it is a positive one. How you start your morning will reflect on how your day will be. Remember when I mentioned that “fight or flight mode”? Avoid this if that is what your mornings sound like. This will only cause agitation and irritation through the rest of your day. Work on waking early and not having that rushed feeling. Having time to actually sit and drink your coffee or eat your breakfast. Imagine, being able to have some time for yourself in the morning? Your day will be much more productive. The best thing you can start to add to your morning routine. Seriously – all successful CEO’s, celebrities, athletes and so on have this in common. Most also rise early, and I mean like 4am – 5am. There are plenty of apps out there to help get you started with meditating. We personally like INSIGHT TIMER another great one is HEADSPACE. If you have no idea where to even start, we found THIS GUIDE to help you. It’s crazy how much time we actually waste. I have to say it… especially now with our technology. We personally, were never aware of this until we starting using a daily planner. By putting 5 big tasks on your list and prioritizing them, you are more likely to compete them. Bonus: by completing tasks on a list, there is a positive psychological effect associated with the accomplishment of them. So lists are good! How you wake is how you set your day. It is also important to take the right actions through out the day to ensure a good nights sleep. This also means – no napping! It is best, if you can expose yourself to light first thing in the morning. Open the blinds. Even better, go for a brisk walk. 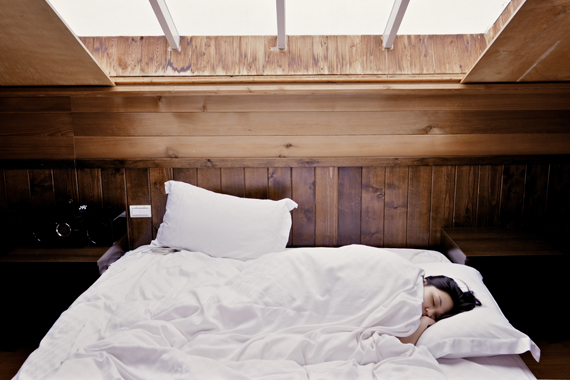 Natural light will help stop melatonin production and increase your wakefulness. Through the day if you’re stuck in an office, try to sneak outside for at least 5-10 minutes. Run errands at lunch or eat outside. Park your car further from your work entrance. Do whatever you can to score extra time in the sunshine. The more bright natural light you can get during your normal waking time, the more your body will know to gear down at night. If you listen to our podcasts you know we always suggest exercise – pretty much for everything! Regular exercise can help normalize circadian rhythms, calm your sympathetic nervous system, and regulate your endocrine function. In return, will give you a good nights sleep. Be cautious though; an intense evening workout can actually make it challenging to calm down, so save the intense workouts for the daytime. If you can get outdoors for a workout, great. If you can be outdoors and barefoot, even better! Why? New discoveries have shown that the earth itself is overflowing with free electrons (energy) that actually get transmitted to us when we come in contact with it. There are numerous studies showing radical reductions in inflammation and pain by getting people in contact with the earth’s magnetic surface. The earth’s electromagnetic surface has the ability to “sync” with our bodies internal clock – so get outdoors and kick off your shoes! Sure, drinking a glass of wine before bed may sound like a nice way to relax. It will be sure to put you to sleep quickly, but will definitely have you tossing and turning in the second part of the night. The stage of sleep that helps boost memory, concentration, and learning – REM sleep is negatively effected. No wonder you are foggy after a night out! You can’t expect your brain to suddenly “turn off” at night. Your body needs transition slowly in order to wind down. That’s where a consistent sleep routine can tell your body to automatically start to gear down and help you sleep better. To better ease the transition, incorporate some relaxing activities an hour or so before bed. Take a bath (heating then cooling your body helps promote drowsiness (see more on that at the end of the article), read a book, listen to calming music (PLAYLIST TO FOLLOW), or practice breath awareness. Overall, avoid any stressful, stimulating activities—doing work, discussing emotional issues and yes, watching television. These activities can cause the body to secrete the stress hormone cortisol, which is associated with increasing alertness. By creating a pre-sleep ritual, you’re establishing a clear association between certain activities and sleep. This is a big no-no, one of the worst things you can do is eat right before bed. You should give your body at least 90 minutes after eating before heading to bed. Do whatever calms you. This may be a gentle stretch session, reading, listen to music or having an Epsom salt bath. Make sure you are using your room for ONLY sleep, and well… you know 😉 Sorry folks, but no television in the bedroom, seriously though – really? Do you have a TV in your room? Your room should be a dark, quiet and cool environment to help ensure the best night of rest. Did you know that your skin actually has receptors that can pick up light? Therefore, if there is light in your bedroom, your body will sense it and send a message to your brain and organs that can interfere with your sleep. So be sure to invest in some decent blinds. Also as light levels decreased our melatonin increase, which ensures deep sleep, and may also help regulate our metabolism. If there is too much light at night (including electronics), we don’t get proper melatonin production. That is why – NO TV in the bedroom. IF and I mean IF you must be on your laptop before getting some shut-eye, download f.Lux, this software eliminates the “blue glow’ from your screen – that will keep you awake even after you close your laptop. Apple also offers something similar for Macs + iPhones, it is called “night shift”. How does blue light effect us? If your environment is noisy and keeps you up at night, you may want to try white noise. Apple and Androids offer many different white noise app. Play some calming sounds on your smart phone, or I used to turn on a fan or humidifier. Whatever works for you in order to drown out other noises and relax you into a deep sleep. Originally being from Ontario, I remember humid summer nights spent tossing and turning. It’s known that most people sleep better when it’s cooler or at a neutral temperature. Try adjusting your thermostat or opening a window. Once you find what works for you, try to regulate create that temperature each night. If you find it difficult to quiet the mind before sleep, even after calming yourself down. That inner chatter that you experience is a result of the untamed stress & busyness of the day. With the constant flow of information floating in your mind, it’s important to have a practice to help you eliminate that stress. If you start your day this way, why not end it this way? This doesn’t mean you have to sit in lotus position on your yoga mat. Simply laying in bed and connecting with your body and most of all your breath. Another way is to JOURNAL start to jot down you thoughts, feelings and emotions – think of it as a source of “letting go” or releasing it. There you have it 12 steps to start implementing – slowly! I suggest choosing either one of the MORNING, DAYTIME or EVENING tips to start, and build from there. No need to feel overwhelmed. Start one by one until these new habits become part of your everyday life. AV 055 – Sleep: The Missing Key To Your Optimal Health?